What can you do with a bad tattoo? BEFORE, with marker drawing on top of old tattoo. AFTER. old tattoo is no longer visible. If only there was an eraser that worked on skin! All those past relationships and bad decisions would be so easy to forget. Unfortunately, laser removal is the closest thing to the magic eraser, and it is expensive and painful. Pretend you have no bad tattoo. Imagine a peaceful world in which that tattoo never even existed. Now, picture a good tattoo on the area. Hint- it will NEVER be a current lover’s name, or the same as the old one, and it WILL be bigger than the bad tattoo. Got it? Good. That’s your goal. Keep that image in your mind throughout these steps. Your new tattoo will be larger than the old one. Your new tattoo may cost much more than the old one. You may need to get areas removed with laser, or tattooed over more than once. Your new tattoo doesn’t have to be all-black, or very very dark. It just has to be planned properly. instead of covering up an old tattoo, sometimes you can repair it. If you like the subject of the tattoo but not the execution, this is a good option. Find an artist. Look at every tattoo shop and website you can find. Shop around- at shops. Don’t go to someone’s basement or home to get tattooed. Look at professional artists only. It will cost some money, since coverups take longer to do, but it will be worth it to get rid of the old mistake. A professional artist who likes to do cover-ups or repairs will take the time to work with your already-existing work; they may send you to a laser removal specialist to get certain areas lightened (much cheaper than total removal), and they can make the old tattoo disappear under the new one. Look at all the portfolios you can, and pick up a few tattoo magazines. Who is doing something that is similar to the style of your imaginary, new tattoo? Try to find someone whose work resembles what you’re picturing as your new tattoo. Don’t look at the subject matter, look at the style. Look at the color choices, placement, and way of drawing. If you like it, it is good. This is your personal art collection, and your taste is all that matters. Talk to an artist. For coverups, you will most likely have to go in person to the studio and talk to the artist. Ask them if they enjoy doing cover-ups or repairs. Getting a firsthand look at the problem is the only way to really plan a cover-up. Listen to what they have to say; take it into account. They cover up old tattoos often and will probably have some good advice for you about your particular situation. If they tell you something isn’t possible, listen to them. If they give you advice about ways to hide the older piece, pay attention. Coverups must usually be much larger than the old tattoo. They also must have at least some areas of shadow to hide any pre-existing dark areas. 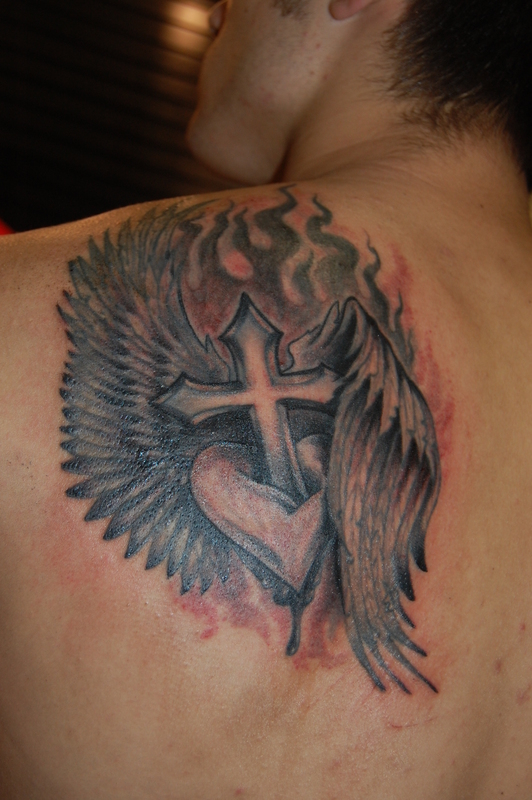 Tattoo inks are translucent, and a paler color will eventually let a darker one underneath it show through. This does not mean your coverup has to be all black. “Tribal” designs are actually a very poor choice for a coverup design, as they rely on areas of smoothly curving negative space to be attractive to the eye. The negative space is empty skin, and usually it takes a lot of work to coordinate this negative space in a design with what is already present. You will not usually find a design ready-made to cover up your tattoo. Remember, it can come up through lighter colors. Your artist will have to draw something specifically designed to hide your previous work. This may take time, so be patient. They may want to trace the area so they can use reference to draw on at home, or they may suggest freehand work. cover-ups don’t have to be dark! 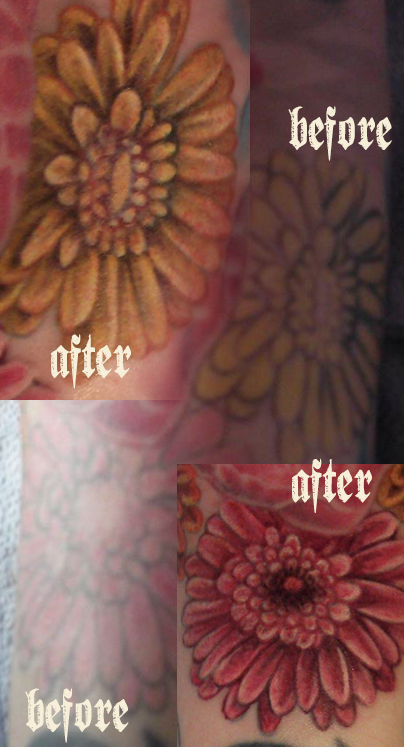 Freehand coverups done by good artists are the best solution to covering up an old unwanted tattoo. By drawing directly on the skin (drawing is done first with marker, then tattooed on) the artist can take into account the form of the old tattoo, as well as your anatomy. The most important step in the entire process is finding the right artist. Look for someone you like, whose art you admire. Try to find an artist who enjoys not only coverups but also really appreciates the same kind of artwork that you do. Since all coverups are custom tattoos drawn by the tattoo artist, make sure the artist you pick has the same kind of taste you do. Coverups can be very expensive. Tattoo artists know that if you had valued your personal canvas, and their artform, you wouldn’t need one! Be sure to tip well when getting a coverup done. Most artists spend more effort and time drawing for coverups than they would drawing an original tattoo, and most don’t charge anything for their drawing time. Be aware of this extra work they’ve done and tip accordingly. You can’t get a coverup on the spur of the moment, unless it is so tiny that it’s hardly visible to begin with. You’ll have to plan in advance and think quite a bit about your new tattoo. Hasty decisions are the reason coverups exist in the first place, so take your time and do some research before you buy. Getting a coverup may limit your choices in some ways, but the subject matter is still wide open. Knowing that it may have to be darker and larger should not keep you from getting a tattoo you can be proud of, and if you find the right artist you may even forget the old tattoo was there. If you have an idea of the subject matter you want, you can find a way to make it work, as long as you find someone who is capable of tackling the job.